September 20, 2010 Categories life2 Comments on Viva Nashvegas! 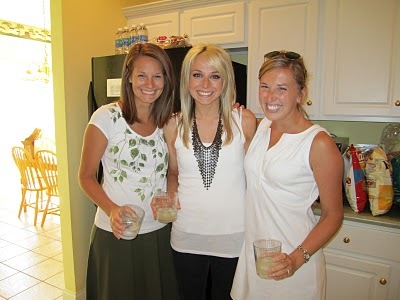 I spent this past weekend in Nashville, one of my favorite cities, for Adrienne’s bachelorette party. I had been looking forward to this weekend for months, and it did not disappoint! I met about 10 other ladies there for a weekend of laughter and champagne and fun. Though we did many other things during the weekend, we spent roughly eight hours traipsing around town Saturday night/Sunday morning for the Big Bachelorette Event. I, being such a good friend, volunteered to be the DD. Luckily, that allowed me plenty of time to take advantage of some excellent people watching! I suppose, before I go any further in this story, I should reveal one secret I’ve been keeping from you: I’m not pregnant. But my BFF Jenny is!!!!!!!!! Exclamation points can’t express HOW HAPPY I am about this! and I’ve been struggling to keep it a secret ever since. Since word recently got out on Facebook, though, I figured that gave me the go-ahead to tell you. Plus, that fact is essential to part of this post. So, Jen and I were DD’s, and just let me tell you, we looked really cute when we went out Saturday night. Really cute! However. I’m not sure if it was the fact that we weren’t drinking, or the fact that we were wearing wedding rings, or the fact that one of us was pregnant and one of us was hanging around the pregnant girl all night, but, I regret to say that we did not have much luck with the men-folk. Not that I wanted to be the center of attention all night, and not that I need validation from men outside of my marriage. Of course not! But a girl would never turn down a few compliments, right? I believe the following examples paint a picture of the bad luck Jen and I had Saturday night. I’ll call it “The Big Bachelorette Event — Designated Driver Edition — As Told From the Point of View of Jillian and Jennifer.” Enjoy. Guy comes up to me. “Want to dance?” he asks. “No thanks. I’m married,” I say. Guy immediately walks away. “May I have another napkin, please?” I ask the waiter. “Sure,” he replies. Waiter never comes. I have to use my teeny beverage napkin. Friend asks the waiter if she may order a drink. “Sure!” he says. Waiter comes back with the drink within 2 minutes. “May I have some water, please?” I ask him. “Sure,” he says. Waiter never comes with water. But he does come bearing a refill for my friend’s drink. I smile. Guy reaches out to touch my arm.Whoops, no. He’s talking to my friend. He is touching her arm. Crap. Is that a pickup line? “…uh, cool?” I reply. This is getting ridiculous. There Was Even Division Between the DDs! I am complaining to Jen how guys keep flocking to everyone but us. We joke and laugh about it. Suddenly, as if they knew what we were talking about, two guys approach us. Bad Breath Guy starts chatting my ear off. I try not to inhale. I zone out. “Yeah, I guess that means it’s either me or her,” Jen replies, pointing to herself and then to me. Previous Post What did I do Wednesday night? OMG, best blog posting ever! Don’t you ever wonder if there is a vibe of some sort that much change after you’ve been married a few years? And now that I’m pregnant, I look forward to ANY compliment. Some weird lady was gushing over me, and I seriously felt like I did when I was 19 and a guy was flirting with me. WHAT HAPPENED TO ME?! Pingback: I wonder if I can go back and get a foil vase? « For the last time, it's JILLIAN, not JILL!